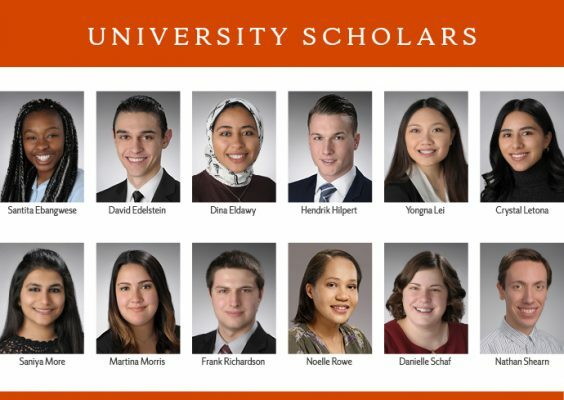 Twelve seniors have been named as the 2019 Syracuse University Scholars, the highest undergraduate honor that the University bestows. University Scholars will represent the entire graduating class at the May 12 Commencement ceremony. On Wednesday, May 8, the scholars will be honored at a reception at the Chancellor’s House hosted by Chancellor Kent Syverud and Dr. Ruth Chen, at which they will receive special medallions to be worn at Commencement. The scholars will also be honored at the One University awards ceremony on Friday, April 12, in Hendricks Chapel. The Syracuse University Scholars Selection Committee, a Universitywide faculty committee, selected the 2019 scholars using criteria that included academic achievement, evidence of independent research and/or creative work, evidence of intellectual growth and/or innovation in their disciplinary field, contributions to the academic environment and endeavors of the University, a personal statement and faculty letters of recommendation. Nathan Shearn, an anthropology major in the College of Arts and Sciences and the Maxwell School and a member of the Renée Crown University Honors Program.